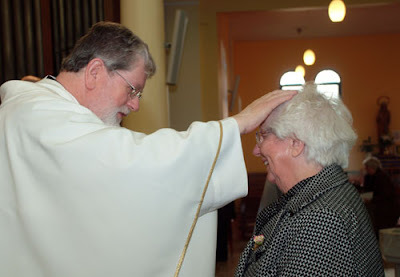 A 65-year-old widower and father of four was ordained a priest of the Diocese of Cork and Ross in an emotional ceremony over the weekend. Billy O'Sullivan from Carrigrohane in Ballincollig parish, Cork, was congratulated by his two daughters and two sons after his ordination in Carrigaline. A fire engineering consultant, he became an insurance fire surveyor in 1966 and was involved in fire safety from then until his recent retirement. Billy's wife, Mary, died in May 2002. He said that as a young man he had no sense of vocation to the priesthood, but some time after Mary's death experienced an overwhelming desire to become a priest. Following discussion with Bishop John Buckley, he formally applied for admission as a seminarian and commenced his studies and priestly formation in August 2003. He anticipated that studies in Maynooth would be something to be endured, but in fact enjoyed his time there immensely, he said. Following a relatively short period of four years in Maynooth, he was ordained Deacon in May of this year. Billy was appointed Chaplain to St Aidan's Community College, Dublin Hill, in September and will continue in that role following ordination. Mr O'Sullivan's Ordination Mass took place on Saturday morning in Carrigaline Parish Church. The Mass was presided over by Bishop Buckley and concelebrated by priests of the diocese, along with friends of Billy. The newly ordained Fr Billy celebrated his first Mass yesterday in Ballincollig Parish Church at 3pm. Participants in the ceremony included Fr Billy's daughters and sons as well as his extended family.